In the Opening Ceremony of the Sydney 2000 Olympic Games, there were almost 13,000 performers who were joined on the field by 12,000 athletes. But all started with a single rider on a horse. 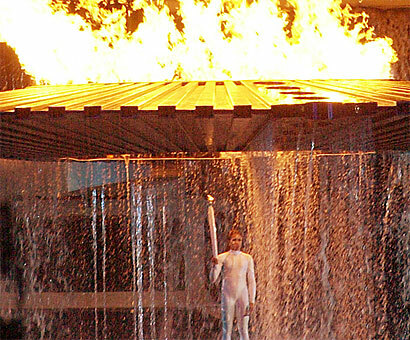 And afterwards Juan Antonio Samaranch, President of the International Olympic Committee said that it was the most beautiful ceremony he had ever seen. When Sydney was awarded the 2000 Games, the choice for Director of Ceremonies was hardly surprising. Spectak's CEO Ric Birch was not only Australia's leading major events producer, was also the only person in the world to have already produced the ceremonies for two other summer Olympic Games - Los Angeles in 1984 and Barcelona in 1992. Birch assembled the most impressive group of directors, designers, composers, choreographers and technical experts ever seen in Australia's creative history and together they went on to make the now-legendary Sydney ceremonies - the most complex ever attempted. For the first time the opening ceremony was planned as a continuous narrative rather than a series of disconnected segments, and Sydney also introduced the dizzying, overhead flying lines for performers that have since become a staple ingredient for major stadium events. As Director of Ceremonies, Birch was responsible for Opening and Closing Ceremonies, Medal Ceremonies and the Athletes Village Welcome Ceremonies.